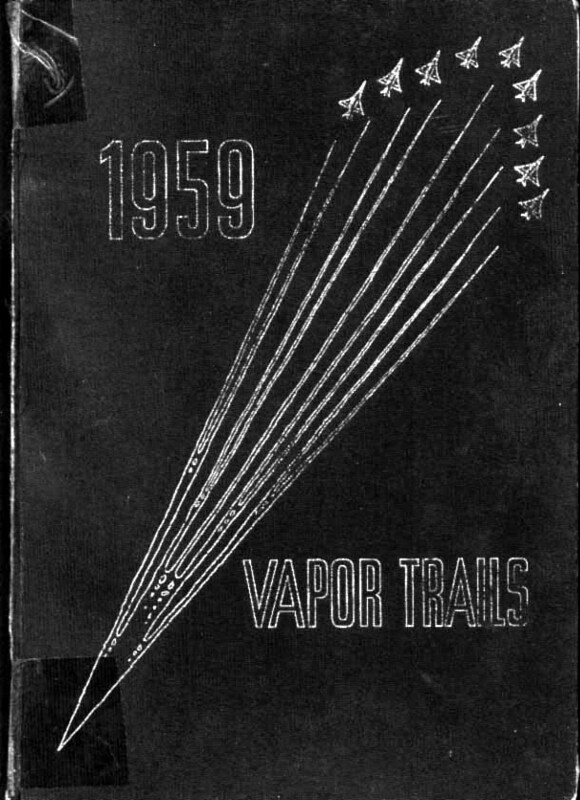 Welcome to the '59 Vapor Trails! The school was seeing many improvements this year - new lockers, new gym, new cafeteria, new typewriters, clocks, a fence for the playground. A history not only of the school but for each class - the yearbook staff provided more lore for us to explore! Look for our friend Nasreddin Hodja making occasional appearances. The Senior Class sold Christmas trees to fund the Sno-Ball Dance (remember dressing Santa? ), and the gala event of the year was the product of much hard work from the Junior Class, the Junior-Senior Prom! It seems there were so many dances - the Valentine Dance, practicing the Boston 2-Step for the Hard Times Dance... (I'd sure like to know where that one came from!) Of course, it wasn't all dancing and goofing around - there were finals and college board exams, too, but fortunately we don't have to even think about those any more! Thank you to Chris White '60 for the original scans. A second thank you to Meg Stieg Dalton '59 for loaning her yearbook which was re-scanned by Jill Park Doyle '71.